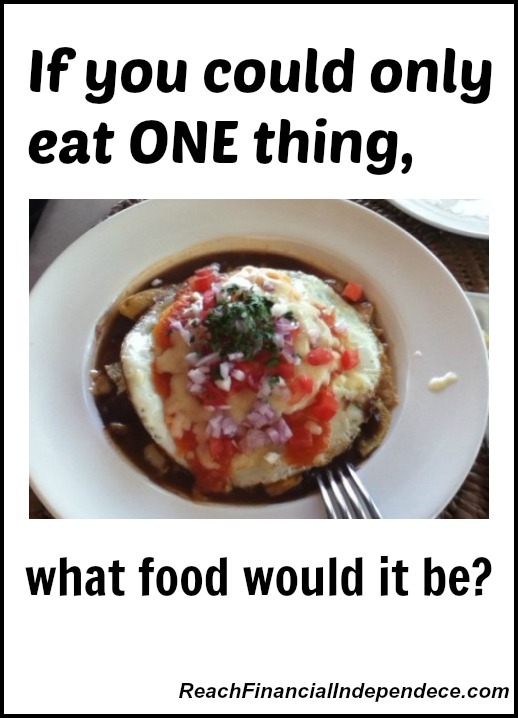 If you could only eat one thing, what food would it be? 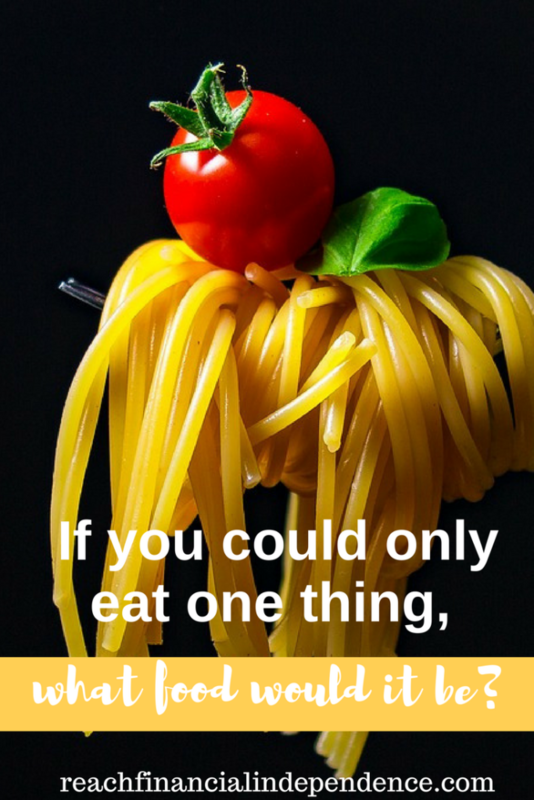 If for the rest of your life, you could only eat one dish, what would you choose? Breakfast, lunch, and dinner? You can chose a dish with several ingredients, but not a soup, with a side of sushi, a side of steak, and a side of chocolate cake. I think I would go for some kind of stew. It is healthy and warm, you can have it cold in summer, and it keeps you full. I love beef and lentil stew, and also beans and chorizo stew. I would rather have that than anything sweet, I’d get bored very quickly with a desert dish. As I talked back in November about ways to simplify your life in order to concentrate on what is really important to you, food was an example. If you stop staring at the fridge every morning, make a batch of breakfast burritos on Sunday and eat that for a week, you will have more time to think, create, work, play, even watch your favorite show’s new season! While I like to eat, and genuinely enjoy a gourmet meal, I know some people just eat to get full, and wouldn’t mind eating the same thing every day. My mum just eats to keep herself alive. Once a week, she goes to the supermarket and comes back with the same things all the time. Ready meals to microwave, cooked chicken, peeled shrimps, baby tomatoes… I don’t think she ever spends more than three minutes preparing a meal, except for very rare occasions when she would grill a steak and boil some rice. You will never see my mum chopping vegetables, or baking a cake. By keeping her cooking effort minimum, she has time to do other things. As a teacher, she tutors kids at night. When she comes back, her meal is ready in three minutes, and she relaxes and watches TV. She doesn’t miss the cooking because a good meal is not very important to her. I am quite the opposite. While I could probably eat my stew every day, being given other options I’d rather not. Here are a few tips to get the best of both worlds, keep your cooking low and your palate happy. There is a book called 365 ways to cook chicken. And guess what? There is another book called 365 MORE ways to cook chicken! On Monday, I can buy butcher a whole chicken and have my favorite chicken dishes all over the week. 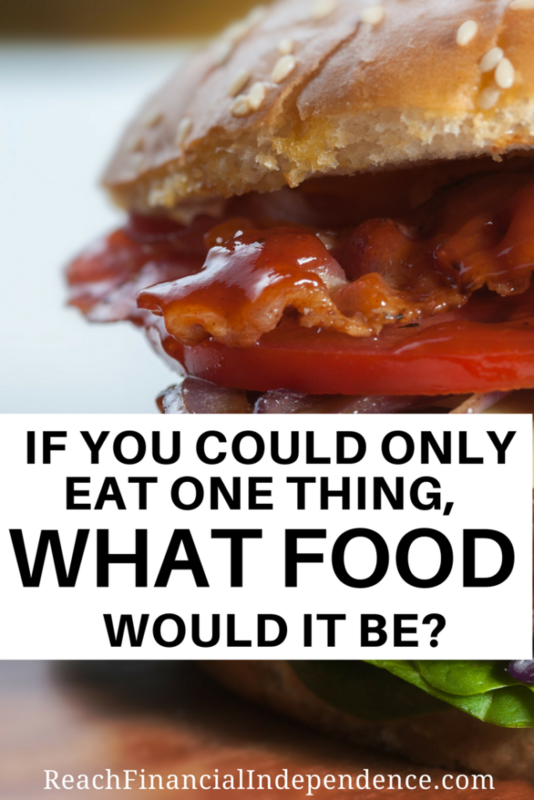 Fried chicken, chicken pad thai, chicken soup, a risotto with the chicken broth come to mind. PROS: Nothing goes to waste, you use every possible part of your chicken and save money. CONS: Lots of recipes mean a lot of time spent in the kitchen. Every time I make pizza, I prepare enough dough to make a second pizza, and freeze it. Same thing with stew, or anything really, I always cook for at least another meal. PROS: Again, I am saving money by making bigger portions, as I am using my oven once and I can buy staples in bulk. I am also saving time by cooking once a big enough quantity for a few meals. CONS: If I don’t preserve the food properly, it could go to waste. I like to freeze things in small portions so that if I unfreeze I don’t have to eat that food for days. Some dishes can’t be frozen, like salad, and if you don’t want to throw it then you have to eat it in the next 24 hours or so. When I prepare a roast with side vegetables, I can turn the extra veggies into a wok with rice and soy sauce, or purée them, or make a soup. The extra roast can become a cold meat sandwich, be chopped into a stir fry, or sliced into tacos. PROS: You are technically eating the same thing, but you don’t feel like it. Less waste, more money in your wallet. CONS: Someone at your table will probably notice and say ”isn’t that the roast from yesterday, and the day before?”. There is only so much you can invent in order to recycle certain ingredients. Laurie over at The Frugal Farmer is a real artist at is, check out her before/after pictures, you would swear it’s not the same dish. A few spices can totally change a meal. If you cook some potatoes and eat part of it mashed, you can oven bake another part with thyme and rosemary, or make patatas bravas with paprika, and so on. PROS: Cheap, will change a bland rice into an Asian or Mexican or Cajun rice, usually for zero added calories, unless you go heavy on the BBQ sauce. CONS: Your other half may not tolerate pipping hot chilies and have forgotten to tell you. What other tips do you have to keep cooking simple and save time/money? I’d probably go with steak and veggies. Yeah, I know . . . kinda boring, but I’m a pretty simple guy. Don’t get me wrong, I love to cook and mix things up, but in the end, I have pretty simple tastes. Unfortunately, I like the fatty expensive cuts of meat. Not cheap. Oh well, food is one thing I don’t compromise on. Boring but healthy! I used to love a half pound cut of beef but have reduced meat consumption lately, I got kind of bored, no health or animal rights issues. Like you I enjoy good quality ingredients and won’t skimp on food. I’d have grilled trout with cheddar biscuits, they’re the only thing with cheese that I like. I’m quite a bit like your mom. For me food is fuel and I can eat the same meal for several days in a row. I don’t really get bored too easily so if I can stomach it I’ll probably be willing to eat it. that makes cooking very easy, if you prepare a dish that lasts 3-4 days you’re good for a twice a week cooking. That’d be great, except my wife is a bit more like you. This can create conflict because some nights I really do want what I had yesterday, but she wants something completely different. If I could only eat ONE thing the rest of my life, I think it would be pizza. But only if I would get all my nutrients out of it, which is impossible 😉 I do eat chicken very often and think it’s a great choice for non-vegetarians since it can be used in so many dishes. I’ve definitely been a little more focused on food and what is healthy (and what is not!). I hope you keep writing about these sorts of topics in the future. DC @ Young Adult Money recently posted..Ordering from an iPad – What Will be Automated Next? I think you can get all the nutrients from pizza, it is a bread after all, so if you put cheese for dairy, some meat and a few vegetables you should be good to go! If I could eat only one thing and getting all my nutrients out of it, it would be raspberries! I know, boring, but I absolutely love them and have since I was growing up and my Dad grew them in our garden. We use many of the tricks you mention to help us save time/money. We also cut up and freeze a lot of our veggies from the garden so we can pull them out throughout the year and use them right away. John S @ Frugal Rules recently posted..Is Your Retirement Planning Frightening? I didn’t know raspberries could give you all the nutrients you need. They are delicious. I chop and freeze veggies too, so convenient when you just want to add a handful of celery or spinach and it is already ready to go. homemade italian pizza would be my pick.. It got bread, cheese, tomatoes, ham and vegetables. Chicken is very versatile, and we prepare it in many different ways. I like websites where you can add your ingredients and it generates recipes. yay! congrats on the self hosting move! Awesome post, Pauline, and I’m with you on the stew – it’s the perfect nutritional balance. Thanks for the mention about recycling: we just did this again with the Easter ham – I made two big batches of bean and ham soup, and a ham and cheese casserole to boot! I would go with quiche. It is my favorite meal and it can be prepared in so many ways. I love it and I am just glad that I can cook a mean quiche. Just love it. Grayson @ Debt RoundUp recently posted..Can Credit Cards Actually Help You With Being Frugal? quiche is awesome, very versatile and easy. I have started making a vat of fruit salad on Sundays and putting it into small containers. That way I know that part of our lunches are done and that we will be getting fruit everyday. I’m also more likely to eat the fruit salad than an apple on its own. My spouse has been stir frying veggies and putting them in little containers too, to make eggs for breakfast. With the veggies precooked, it only takes two minutes to make a healthy, protein-filled breakfast that keeps you full for the day. very convenient indeed. Although I read that fruits lose most of their vitamins quickly after being chopped. I have ready tomato sauce (I just blend tomatoes, garlic, onion, thyme, jalapeno chili) to pour on eggs in the morning, it can be refrigerated for 3-4 days and makes breakfast super fast as well. I make a meal plan every week. That way I cans see if I can use the same ingredients in multiple meals. This is very helpful for things like vegetables which will just go bad in a week if they aren’t used. I also have some pre-made meals usually in the form of a steak or frozen pizza dough (homemade) that I can thaw out if I know I’ll be coming home from work late and don’t want to cook. It is more complicated to avoid waste when you cook for one. I also froze portions of pasta sauce to thaw when I worked, the time to cook the pasta the sauce is ready and healthier than the industrial one. I’ve gotten to the point where I just accept some waste. Unless I eat the same thing every day for dinner, it’s often unavoidable. Only one thing? Peanut butter, right off a spoon. No more excuses, trying to justify having it for every meal. Heaven!!! haha! not even sure it will be bad, like this guy in supersize me who eats 2 big macs a day but walks 4 miles to get them, no fries, no soda and he is in great shape. I would have oatmeal every day. (although can I have blueberries on it-please?) 🙂 I’m a simple cook, so that keeps the cost down I guess. I can eat a salad and a bean burrito for days on end. I like the “idea” of being a gourmet cook, but in reality that’s not happening. I’ll take the salad and burrito but oatmeal for days, even with all kinds of delicious berries would get old. If you like the idea of having a chef at home but not being the chef you need a chef BF! Mine opens oysters and shells to do a mean seafood cocktail, other than this I am the boss in the kitchen. I’d probably say some type of Korean food. It’s always tasty, too bad I don’t know how to cook any of it! I have tried to make Chinese and Thai, never tastes the same as in restaurants either. Salmon and steamed veggies would be my choice, as a responsible adult. My second choice would be a nice piece of dark chocolate. 🙂 I do enjoy cooking, but it can be hard balancing everyone’s different preferences. I don’t like to waste food either, but we’re not big leftover fans. I try to adjust meals to make sure there are no leftovers. sure, the more people, the more accommodating you have to be. I think it would be the same meal over and over at my house if I had to feed several people with different tastes, I’d just go with the one they all like all the time. I’d go for omelettes, I love breakfast foods the best. I agree with batch cooking, and like anything in the crock pot. Thankfully, bf’s not a picky eater so we eat leftovers a lot. I miss having a crock pot, so easy to prepare food and it always tastes great. my junk food guilty pleasure is a big mac but not sure I would have it every day for months. thanks for the tip about the pizza sauce, will have to try that. Oh man I don’t know!! It’s funny, I love to cook and have favorite meals but could probably live off cereal haha. To save money I buy cheaper cuts of meats and cook them in the slow cooker- it magically transforms even cheap meat into something delicious! slow cooking makes the fatter cuts (the cheaper ones) soft, whereas if you fry them they get hard at first. While I enjoy cereal for dinner once in a while I wouldn’t feel like it is real food if having it for days in a row. Food is a constant battle for me – I hate to prep and clean up meals, living alone. So I try to make something of 4 serves, so some can be lunches, and other ‘lazy night’ dinners. I’ve even set GOALS to make sure I’m cooking at home, cause it was getting ridiculous how much I was eating out (sure, I can ‘afford’ it, but the money could be better spent). But I struggle to know what I ‘feel’ like, and like you, I get sick of meals. Slowly I’ll master it! SarahN recently posted..Long Weekend: The DONE list! nothing worse than having a meal just to avoid waste when you feel like something else. With time you’ll narrow it down, I tend to prepare less meals than needed in case we aren’t very hungry or feel like eating out/snacking/having breakfast for dinner or a sweet dinner. So the leftovers aren’t staring at us and we can do it. These are great tips! I really wish that I could do things like buy in bulk to save money, but when you live on your own I feel like it’s difficult to do that without things like chicken going to waste unless you are ok with eating chicken literally every single day. In NYC it oftentimes makes more sense to just order in healthy food since it’s cheaper than groceries! I was surprised at the price of all you can eat buffets in the US, many were just $7-8 and had a great selection of healthy foods like sushi, salads, fruits… that would cost a lot to buy at the supermarket. And people came in to fill in on cheap fried stuff, helping the restaurant turn a profit while I was eating shrimps for hours at a time! Not accounting for the mercury in it, it’d be chirashi — raw fish and rice with miso paste. Runner up would be foie gras on freshly baked French bread and fleur de sel. Nice choices! Once my mum came to Guatemala for Christmas with a huge delicious foie gras and I had it for days, but it either went bad or I got sick of it, not the best memory and even though I am a fan I’d opt for the chirashi for health benefits. PS I had to fish you back from spam with your new URL.. The Jollyhoos keep it ultra-simple. None of our meals are served hot. So when we get home we are simply pulling containers out of the fridge and tossing food on a plate. We make hummus and have a side of red beans with mustard or something like that. Super inexpensive, healthy, quick, and delicious. We are big fans of the big batch from which we can draw all week long. The one food item with which I could not live is very thick hummus with lots of tahini, flax seed, and no lemon. This was a fun to read article. Thanks Pauline!! hummmmmus! I love that stuff. Might be ex aequo with guacamole on my favorite dip list. No hot food, really? I would miss the comforting warmth in my belly, especially in winter. It does make life easier though. You would make this tough wouldn’t you. I would likely say a one pot meal that included meat and veg and although the pizza sounds good my body might not agree with it. I can only imagine how much I’d have to work off if I ate pizza every single day lol. When it comes to cooking we like to cook a big meal so we can eat it for a couple of meals from it. That just gives us more time to focus on other aspects of life. We do cook every single day and hardly if ever eat out and like to create new dishes often. My tip would be to menu plan, select foods that you can switch up meals with to make others like you say. Food doesn’t have to be complicated nor time consuming. Great post Pauline!! your pizza is pretty calorie loaded, I do a veggie one with little cheese that I think would be healthy to eat every day. But it would get boring. If I could eat only one thing and there were no deleterious consequences attached, I’d probably stuff myself with pizza morning, noon and night. In fact, that’s pretty much what I used to do…and not surprisingly I was about 6 stones overweight. Well, if I truly had to eat only one food for the rest of my life, it would have to be something nutritionally complete, or close to it – such as kale, or durian fruit – but that would become torture after a while… in the prepared dish department, it would be red beans and whole grain rice, hands down, seasoned Mexican style, which is what I made a crockpot full of today. I’m on an extremely strict budget as part of my FI plan, and I agree with your Mom – I spend my fun time outside of the kitchen, so I live on: bananas, citrus in season, oats, soymilk, nonfat yoghurt, greens (and tomatoes) in season, beans, rice, potatoes, onions, garlic, coffee, tea, and dark chocolate. That’s it. And I eat very well, using Mexican and Indian spices, some honey and cinnamon, paprika, black pepper, and salt. Almost no oil – some safflower and olive oil. Will start sprouting something easy and cheap (such as raw sunflower seeds) soon. I save time by making big batches of stews, soups, and casseroles, and either refrigerating or freezing them. Easy-peasy. I didn’t know durian was a super food. Super smelly yes, not that it would provide a good diet too! I love beans too, garbanzo, lentils, any dried bean, the BF isn’t really on board with that but we compromise. They are filling cheap and healthy. I’m probably the worst person to answer this question since I just put up a post about how lazy I am and how I can’t seem to get motivated to cook a meal at night. But if I were making more meals I’d definitely be using my crockpot. There was a period of time I was pretty good about cooking and during that time I was crock potting a lot. I loved having a crockpot. Not much prep needed and you can go to work and back to a homemade dinner. It is hard to fail at cooking with one. I love to batch cook for the whole week. I usually do this on Sunday’s when I would regularly cook large meals anyway. If I had to chose one food to eat for the rest of my life, it would be peanut butter. Plain and on a spoon YUM! It is so much better than any sweets out there. Financial Black Sheep recently posted..What Would you do With a Windfall of Money?